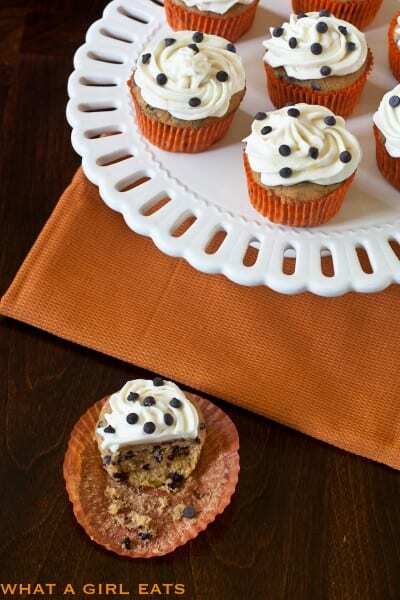 Pumpkin chocolate chip cupcakes are the perfect sweet autumn treat. 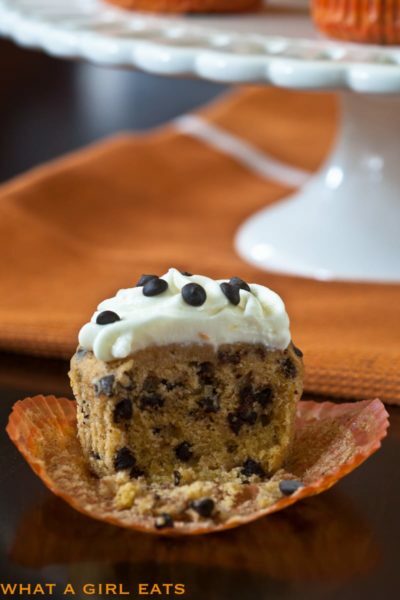 Moist cupcakes, full of pumpkin flavor, studded with chocolate chips and a swirl of cream cheese frosting on top. Yep, tomorrow’s the first full day of Autumn and I can barely wait, so I’m starting just a few hours early. I love fall and everything about it! The smells, the colors and naturally the pumpkins. 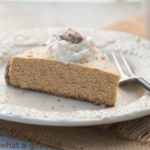 When my mom first told me about Duff’s (The Ace of Cakes) Pumpkin Chocolate Chip Cake, I couldn’t understand how it could be his most popular cake recipe. I guess I’m a bit of a purist and didn’t want anything coming between the pumpkin and its’ spices. Lo and behold, that was before mom brought in a batch of pumpkin chocolate chip cupcakes and we put them to the family taste test. Ok, so I was wrong. Not only do pumpkin and chocolate marry well, they might just be a match made in heaven. 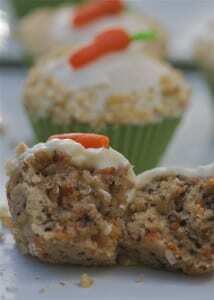 Instead of using Duff’s buttercream, mom topped them with her Cream Cheese Frosting, which has just a hint of orange. Mom made a couple of changes to the recipe and I tried to simplify the recipe for a home cook. So here is mom’s slightly adapted recipe for Pumpkin Chocolate Chip Cupcakes with Cream Cheese Frosting. 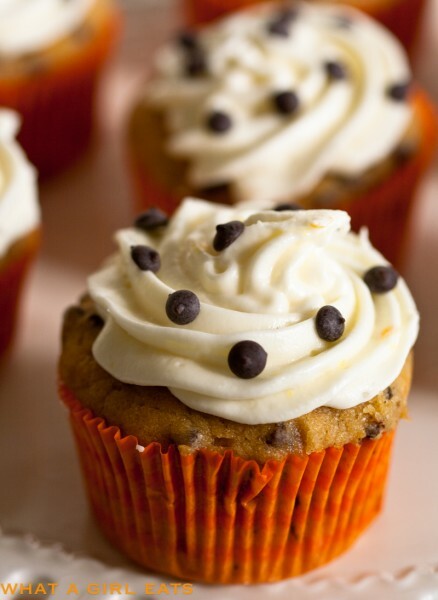 Pumpkin Chocolate Chip Cupcakes with Cream Cheese Frosting slightly adapted from Duff Goldman. In mixer on low speed, combine sugar and butter until well mixed, scraping down the sides of the bowl occasionally, about 5 minutes. In a separate bowl, whisk together the vanilla and egg whites. Stir the pumpkin puree into the whites just until incorporated. Add the dry ingredients and the pumpkin mixture to the egg and butter mixture, using about 1/3 of each mixture, and mixing each time, just until incorporated. Mixture should be blended and even in color. Fill cupcake liners 3/4 full. Bake at 350 degrees F. for 10-12 minutes or until toothpick inserted in middle comes out clean. In a mixer fitted with a blade, beat butter and cream cheese until well blended. Add vanilla, orange juice and zest. Slowly add the powdered sugar, scrapping down the sides as necessary, beating until well blended. Filed Under: Dessert, Food, Sweets Tagged With: autumn desserts, cupcakes, Dessert, Pumpkin Chocolate Chip Cupcakes, sweets. 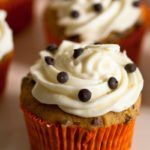 Delicious pumpkin chocolate chip cupcakes, beautiful also thanks for sharing with Hearth and Soul blog hop. pinning. 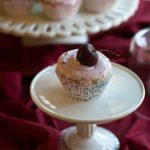 Pumpkin and chocolate together in a cupcake sounds like a wonderful idea. The orange added to the frosting must taste fantastic too- I’ll have to try it! 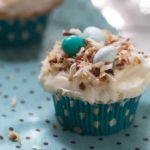 These cupcakes sound so yummy! Perfect for fall! These cupcakes look awesome! I wish I had one right now! 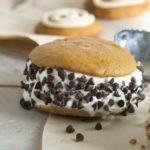 I LOVE the pumpkin and chocolate combo, and seriously, how can you go wrong with buttercream? 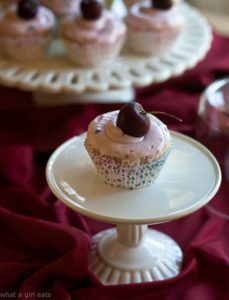 Glad you mom brought some inspiration to these cupcakes, b/c they look amazing!